Lake Eola Park is popular destination in downtown Orlando, with many people taking advantage of the beautiful surroundings to stroll around or sit on one of the many benches. The sidewalk that circles the lake is .9 miles in length, making it easy for visitors to keep track of their walking or running distances. 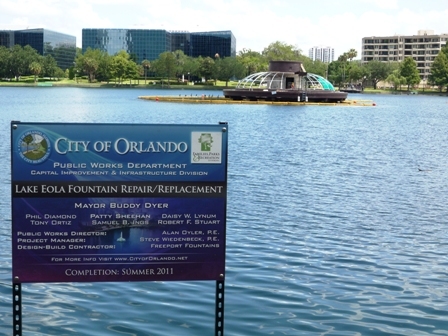 Other activities available to park visitors include renting swan-shaped paddle boats, electric gondola boats, feeding the live swans and other birds inhabiting the park, seeing a concert or a play in the Walt Disney Amphitheater, grabbing a bite to eat at Relax Grill on Lake Eola or relaxing amid beautiful flower beds and a spectacular view of Orlando’s skyline. Don’t miss the Battle of the Bulge monument too! Sunday mornings bring a wonderful farmer’s market to the park, with a variety of produce, great eats, and gift items. In the middle of the park is the well photographed curved shaped fountain. It is undergoing a major renovation right now, but the city hopes to have it done by the yearly 4th of July festivities. This amazing event brings people from all over to see spectacular fireworks. Arrive early, set up a blanket or chairs and enjoy all of the day’s events. Once it gets dark, the fireworks will begin, set off over the water. Book your room now at Thurston House our Central Florida B&B and come see what this Orlando event is all about! We are only 6 miles from the park.